This theatre has a fairly elemental blue frontage animated with a flat glass canopy supported by metal cantilvered brackets. The sandblasted glass windows and mesh folding gates add to the successul layering, though spoilt since the photo by signs and painted beams. 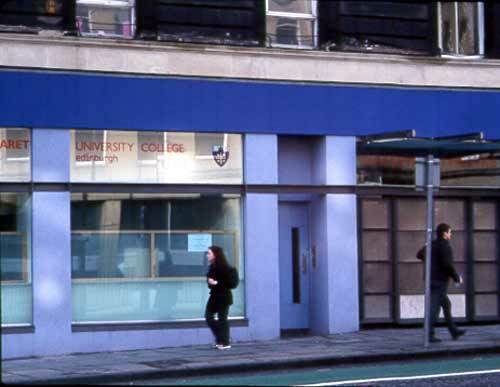 The theatre building was situated at no 41 Elm Row, a section of Leith Walk in Edinburgh. The site was a veterinary college in 1890, and reconstructed as Pringle’s Picture Palace in about 1910. This closed in the 1930s and the building was subsequently used as a theatre by a group of amateur actors. In 1946, however, the premises were gifted to the Church of Scotland who formed their own repertory company. By 1953 the Church decided to hand it over to a fully professional independent company. The company was formed with Robert Kemp in charge and was to include many of Scotland’s finest actors; its repertoire included many plays by contemporary Scottish dramatists. The theatre closed just as Edinburgh corporation was acquiring the Royal Lyceum to establish a civic theatre in 1965.